Modern technology has improved bonding strength and several other key properties of adhesives. However, as good as any adhesive is, it will only perform to expectations if the substrates are sufficiently prepared before glue is dispensed. Surface treatment is the process in which substrates to be bonded are cleaned, etched, functionalized and/or chemically treated to ensure a roughened and receptive surface for the adhesive. Dirt, grime, grease, oil, additives and other contaminants (oxidization and moisture) are often present - even if they can't be seen - and hinder an adhesive's ability to wet the real surface of the substrate. High-quality application and adhesive longevity depends on having receptive surfaces; yet many may see treatment as an added, costly step, or are unsure of the technique specifics. Corona and plasma discharge are two popular techniques for surface treatment: Both expose substrates to electrical charges in air as a way to prepare surfaces for proper adhesion. However, much confusion exists between their differences, which we hope to clear up here. First, a note on wettability. For an adhesive to work properly, it needs to wet: flowing out and maximizing its contact with the surface. However, this process is impacted by surface energy, which is related to surface tension. The higher the surface energy of the substrate the better. Consider water, which may stream across an untreated car freely, but beads up if wax is applied. In the latter case, the cohesive forces of the liquid are greater than the adhesion forces of the substrate, which would lead to a poor application. This may not be a problem when adhering materials like metals and glass - even ABS and epoxy paint have relatively high surface energies - but becomes a challenge for surfaces like polypropylene and polyethylene. Wettability can be seen in the contact angle, which is measured between the tangent line of a droplet at the contact point and the horizontal of the substrate. Angles trending toward zero indicate successful wetting. 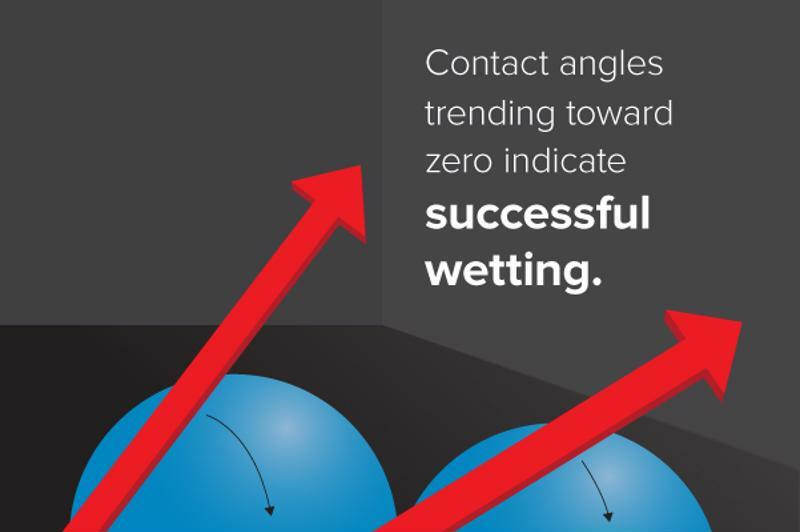 Poor wetting occurs as the contact angle goes higher. In these conditions, surface treatments are used as a means to ensure more suitable environments for proper wetting. The most popular treatments (corona and plasma) introduce voltage to atmospheric air that creates ionized gas full of active molecules, which can then be controlled and directed toward a substrate to raise its surface energy. There are many benefits and uses to these processes, but users need more clarity on the issue. Proper adhesion depends on sufficient wettability. Plasma and corona treatments are inherently linked, making the task of differentiating between them difficult. By definition, plasma is a fourth state of matter, an ionized gas made of several species including, free electrons, positive or negative ions and radicals. In its technical use as a treatment, plasma is a low-voltage ionized gas discharge in a gas at atmospheric pressure that is manipulated or blown to treat a surface. Where it gets tricky is the fact corona treatments also produce an electrical discharge gas at atmospheric pressure, by definition plasma. In the film extrusion and converting (printing, coating and laminating) industries corona treatments are distinct from plasma treatments (not the state of matter itself) in that usually the only gas supplied for ionization is air. In these systems a thin layer of air separates the substrate from an electrode. Corona treatments may either produce smooth, homogenous discharges, or the recognizable arcs and spikes—limited in intensity—that resemble the physical phenomenon of a St. Elmo's fire. Corona treatments are popular in these industries because of the high processing speed, as well as the low cost and upfront investment compared to plasma treatments. However, there are some considerations when using corona treatments. Notably, the effects of corona treatment will dissipate over time. It is recommended that adhesive is applied soon after treatment is finished. Not all surfaces respond well to corona treatment, either. This is why plasma technologies with gases other than atmospheric air have been developed to supply users with further functionality and flexibility (meaning that yes, plasma is a form of corona technically, but corona is a form of plasma, physically). Generally speaking, corona treats using only ionizies oxygen, which may not be enough for treating some surfaces (like Teflon®). Plasma treaters for film application systems generally use the same setup of substrate, gap and electrode, but differ in that they can be supplied with other gases like argon, nitrogen and helium. The discharge created more closely resembles the sheet shape film corona theaters produce, rather than the arced blown corona effect. Plasma is usually used when corona doesn't work well enough, leading the equipment to be considered a bit more as specialized and high-powered. Indeed, the cost and size of the treatment systems often narrow the audience for the type of product. However, plasma treatment does come with many benefits, including what some consider longer lasting results, increased control of gas flow and suitability for batch processing. In industries that treat dimensional objects rather than films, plasmas are identified somewhat differently. The term "Air Plasma" is used to define plasma treaters that use atmospheric air as the required gas chemistry. Both Blown Arc and Blown Ion Plasma treaters are examples of air plasma technologies for treating objects. For object surfaces that are unresponsive to air plasma, variable chemistry plasma or flame plasma can be used. Variable chemistry systems use additional gases such as those mentioned previously, Flame plasma uses propane or natural gas. In many ways, the differences between corona and plasma come down to semantics. Both treatments share fundamental processes and uses. Economic adhesion and efficiency can be provided by both corona and plasma, but the specifics of each application will be the deciding factors.